When a game is backed by a Kickstarter campaign, it means the concept gains a valuable seal of approval from the most important people in a game’s life-cycle: you, the gamers. Publishers and corporate investors have an important role in the industry, but the most satisfying development process is one connected directly to the high expectations of the people who will be holding the gamepad. We have proven business skills to prudently manage development, but with the freedom that funding from Kickstarter will bring us, we can spread our creative wings to make a game that is enthralling, humorous, loud, vibrant and uncompromising in design and features. Your contribution will help us reach our ultimate ‘stretch goal’, which is you, playing Super Samurai, with a big smile on your face, knowing that you’ve helped make the game a reality! Mev Dinc: @MevDinc A 30 year industry veteran and responsible for a long catalogue of games including the Last Ninja series, First Samurai, Super Street Racer and many others. Mev also kicked-off the Turkish gaming sector through Sobee Studios before being acquired by Turk Telecom. Mev likes taking photos and has yet to convince Raff to use them as game backgrounds. Raff Cecco: @RaffCecco 20 years in the games industry plus 10 years in web and business software, Raff was responsible for classic titles such as Exolon, Cybernoid, Stormlord and many more. He founded London-based King of the Jungle, developing for clients such as Hasbro and Virgin Interactive. He also became a technical author and had a book published by O’Reilly Media. Bill Harbison: @iharbonaut A highly regarded artist who has worked on many blockbuster games including Chase HQ, Batman The Movie, Jurassic Park and Runescape. First Samuraiwas one of Bill’s favourite games, so he was very keen to work his magic on Super Samurai, creating beautiful textures and intricate 3D models. Ozan Civit: @cgoz A very talented illustrator, concept artist and art director based in Turkey. Ozan is the head writer and production designer of Rafadan Tayfa, one of the most popular animation series in Turkey. Ozan is producing the all important concept work for the main character and the backgrounds. With Ozan’s great vision, we have been able to create a fantastically unique and atmospheric style for the game. Umut Findik: A very talented 3D character modeller based in Turkey who did such a great job on transforming Ozan’s character concept into a brilliant Super Samurai 3D model. Allister Brimble: @AllisterBrimble One of the industry’s top game musicians, Allister has a string of hits attached to his name including Alien Breed, Project X, Driver and Rollercoaster Tycoon. Of course, Allister also did the music for another of our classic games from the 1990s, Street Racer SNES. We were delighted at the opportunity of working with Allister again. Released in 1991, First Samurai on the Commodore Amiga is one of the most fondly remembered games of the time. Voted ‘Game of the Year’ in 1991 (Indin Awards), it appeared on numerous gaming magazine covers while earning brilliant reviews. It featured innovative and unique gameplay, combining beat-em-up action with exploration and RPG elements across huge worlds. Technically and visually ground breaking, the audio also pushed boundaries with an amazing title tune and unique and humorous sound effects like the famous ‘Hallelujah Chorus’ when chests were opened and epic orchestral stabs when enemies were destroyed. The game was produced by the same legendary team behind the Last Ninja series, headed by Mev Dinc, coded and co-designed by Raff Cecco. First Samurai helped turn the Amiga into one of the most popular gaming machines of the time. The superb Commodore 64 version is also regarded as one of the top-ten C64 games ever! Super Samurai is a complete 3D remake of the classic First Samurai. We will ‘power up’ the original’s fast-paced action, fiendish levels and magical surprises that made it a big hit 25 years ago! We pushed the original’s 16 bits to the limit, and now armed with another 48 bits and modern hardware, it’s time to push those limits again! With passion, experience and knowledge for making hit games, we are determined to make Super Samurai an enthralling adventure that captures the arcade essence and fun of First Samurai, but offers new features, twists, turns, combat, magic and much more! Re-imagining our First Samurai chunky pixel hero into a cutting-edge 3D version was going to be a formidable challenge. Burly, yet athletic, Samurai is equipped to handle all the jumps, twists, turns and combat required by his new adventure! Unarmed Combat: Samurai’s mainstay; he can defeat enemies with fast-paced ‘classics’ like punches or round-house kicks, but as his experience develops, watch amazing combos unleash! Katana: Samurai’s magic katana is gained when enemies are dispatched and their life-force increases his metaphysical energy. More than just a blade, the katana can focus magic power to become a formidable weapon. Elaborate swordplay is essential for dispatching tougher enemies or dealing with an onslaught from hordes. Magic: Having completed his magic training since First Samurai, a repertoire of metaphysical moves and spells are now honed to perfection, ready to unleash. Watch his powers increase further as his battle experience does! Tattoos: Definitely not a superficial fashion statement, Samurai’s tattoos glow to indicate the proximity of metaphysical beings and magical items! A sprawling action adventure steeped in magic and combat needs big worlds and beautiful environments. The Super Samurai world is split into distinct realms starting in feudal Japan, through to magical Anatolia and mysterious lands beyond. Each realm is split into several levels, with the final level in each being a Time Temple protected by a major guardian boss. Once a Time Temple has been won, not only does it open a path to new realms, it conjures magical pathways through time and space to previously inaccessible areas of earlier levels, or even earlier levels in a different time zone! By manipulating the past, Samurai can affect things in his future, or bring with him things from the future that will aid his quest in the present. Magical tori gates punctuate the lavish landscapes, marking locations where Samurai can regenerate after he is vanquished, or to provide additional magical energy. When Samurai needs to rest after defeat in battle or needs to practice his combat moves, he can return to his home dojo at any time, ready to plot a new course through the world map as it unravels with each victory. With the Demon King’s meddling, Samurai’s world has become a chaotic place where time, space and gravity have been manipulated in confounding ways. Be ready to expect the unexpected! First Samurai was packed with beat-em-up action, exploration, magic and bosses. Expect the same and much more, amped up in beautiful 3D environments with amazing effects! Samurai understands the advantage of stealth and surprise attacks, but don’t expect to find him skulking around in corners and dark shadows. Brazen attacks on hordes of enemies are more his style, and he certainly isn’t backwards in attacking forwards! Bosses, bosses and…bosses. We love ’em! Reveal hidden areas in the present by affecting the past! Possessed rats, zombie villagers and beasts from ancient folklore; the Demon King has been busy conjuring the ghastliest foes for the best combat! We are thrilled to announce that Super Samurai’s music will be scored by legendary video game music composer, Allister Brimble. With Allister’s involvement, you can count on a game that both looks and sounds amazing! Allister remixed the original First Samurai title music which was used in the Kickstarter video. Click the play icon above to hear the full track! 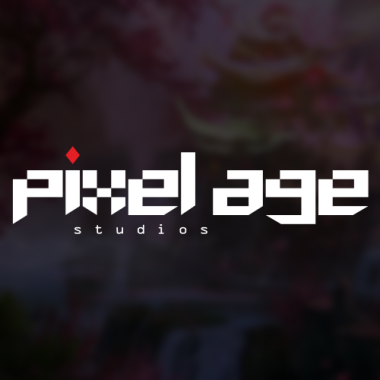 Pixel Age Studios @pixelagestudios was founded by industry veterans, Mev Dinc and Raffaele Cecco, both from coding backgrounds with some 50 years of shared experience across a vast range of game genres and gaming platforms. We are also supported by an exceptionally talented and experienced creative team. From its humble beginnings to the vast industry it is today, our combined experience of the entire ‘pixel age’ of gaming equips us with the critical skills required to deliver the highest quality while managing the many development challenges and pitfalls that making games can bring. During our varied journeys in game development, we have been integral to the success of many franchises, culminating in millions of happy players around the world. We have all had wonderful adventures in game development, however, this new one proves to be the most exciting yet! Our new team is already bursting with energy and enthusiasm, not just to deliver a thrilling game in Super Samurai, but also in new approaches to game development and running a lean studio that punches way above its weight.